This morning, while Mrs. Stein had my kids, I cleaned their dresser for pesach. Each drawer was removed, dumped out, and wiped down. Wetness nullifies chomeitz, so I sprayed a toothbrush with cleaning spray (a nice one from Whole Foods) and went over the cracks and corners. I actually found a piece of challah in Chaya's drawer, so I was pleased. Lots of clothes made it into the thrift store pile. Lots of clothes made it into the "put me away, I'm too small" pile. Lots of odds and ends made it into the trash, like Chaya's ever-growing collection of weirdness. (Winners included rubber teeth, the remnant of a candy ring pop, and cut up postcards). I hope Yaakov and I can tackle the rest of their room this evening. We've been so tired every night, we haven't pesach cleaned. I also called in my chicken order this morning. You long time readers know that there was the CHK/Rubashkin dilemma in my life. Well, we went back to eating CHK about 3 months ago. I had a dream that the Rebbe told me I should be eating it - so that was that. I'm glad we went back to CHK, although it has its challenges. Like the store I called this morning is 45 minutes away, and they aren't taking reservations. He told me chicken would be coming this Sunday. I'll have to "chap a rein," as they say, and get it while I can. This means I'll have to pesach-clean my freezer right after shabbos! So the fridge will be chomeitzdich and the freezer will be pesachdich. Today Srulik, Rivky, and I went to visit the goats. Not just goats, mind you. Cows. Horses. 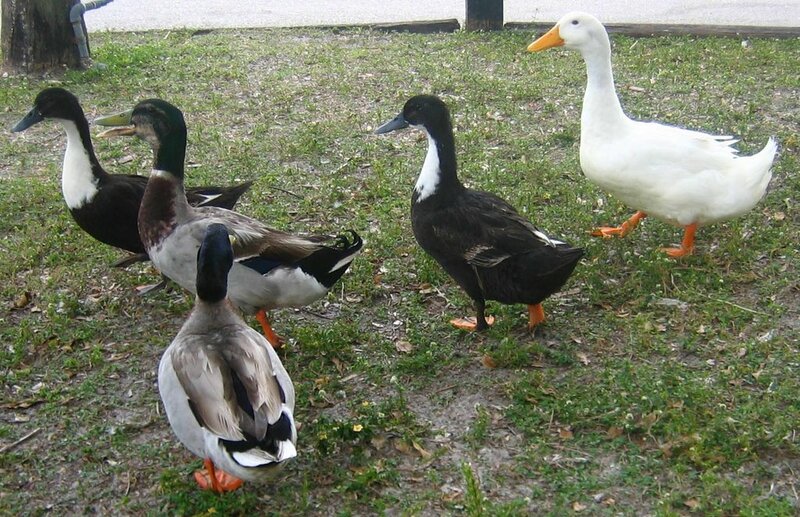 Ducks. Geese. 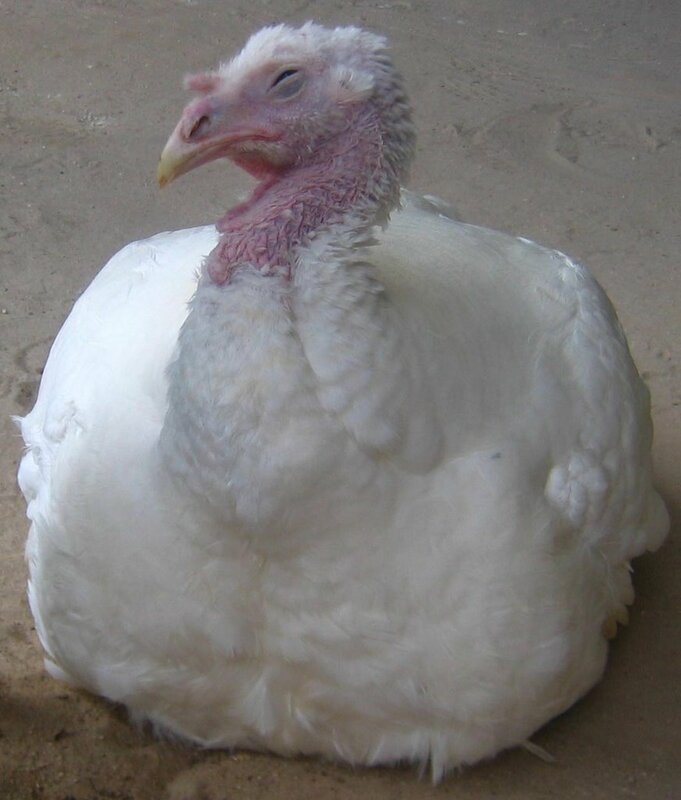 An albino turkey. The biggest pig a Jew should never have to see. This park is about half an hour away from us, well worth the trip. There's a couple of playgrounds there. And the farm/petting zoo. And it's free! So we went to the playground first. My kids were enamored with some girl's electric jeep. They kept chasing her, and she kept driving away from them. Her parents were very nice, and let Srulik and Rivky ride in it too. This was probably more exciting than the goatie-goats for them. 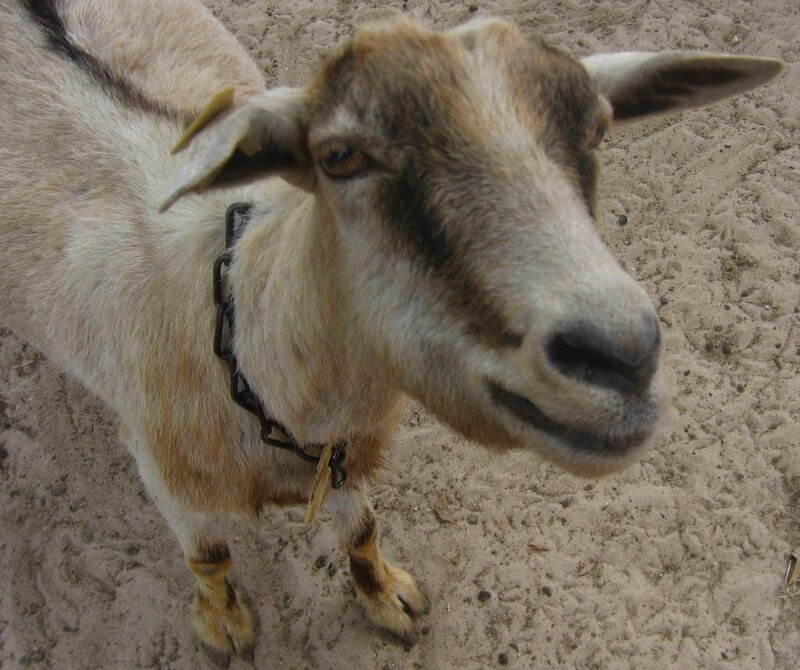 The animals were fun, although one goat kept trying to eat my skirt. Srulik was in scatology-mode. He kept peering intently at the goats' behinds, and also making a big deal to kick any poop he saw on the ground. He also had running commentary about it, my little goat-proctologist. At the end of the trip, Rivky sat down on a bench to eat a rice cake and cheese. We were by the lake. Oh, it was so idyllic - until a gazillion birds surrounded us. They must have rice-cake radar, I dunno. Poor Rivky screamed her head off. Srulik - brave knight that he is - went to chase them off, only to be rewarded with a goose-nip (so glad he was wearing pants). It was a fun morning, made better by lots of antibacterial wipes. Every year Rabbi Blumenkranz puts out a book about the halachos of pesach. 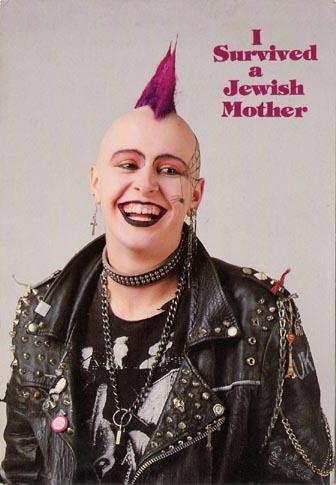 The book also mentions which products are kosher for the holiday. This book becomes a veritable bible for me each year. I need to know what shampoo I can buy, diaper wipes, medicines, plastic ware, yada yada. Not to mention deodorant! He has yet to mention my beloved, aluminum-free, mineral-salt roll-on. Each year I have to buy a junky chemical brand that makes his list (but don't tell, it's a Secret). So, book in hand, I went to BJ's today. Oh, what a nightmare. He put on the book cover that this year's version would be easier to read, but it was confusing as ever. I'm standing in an aisle searching desperately in the book for aluminum foil, and there's a promotional video clip repeating over and over again on a nearby monitor. I wanted to scream. At one point I did mutter a choice epithet, but I won't write that here - this is a family blog. I did manage to find many things though (both in the book and BJ's). I bought plastic cutlery and bottled water (Zephyrhills). I bought toothbrushes and plastic plates and bowls. I bought aluminum foil and plastic wrap. I also bought things I would need after pesach, since pesach ends on a Thursday night. (I want to open my chomeitz cabinet Friday morning and be ready to bake challah. Oh shoot, I forgot to buy honey). I also needed to buy things for now, to get me through the next couple of weeks. Pasta, for one. And soy milk ("Soy Sense" - such a deal!). It was weird to be shopping for both chomeitz and pesach goods. It's like a metaphor for Moshiach, in a way. We're not quite there, yet we are. P.S. It took Yaakov - G-d bless him - 5 hours to clean my car today. So I saw this woman on shabbos whose acne issues were devastating, and I felt really bad for her. At the same time, I felt glad for me. I comforted myself with the thought that my face could be a lot worse. Then I felt bad about deriving solace from another Jew's misfortune. I'm pretty sure this week was my "last hurrah" before pesach in the baking department. No more challahs, no more cakes and cookies. I'll get challah from the bakery and buy ice cream. Nobody will complain. The cholent came out extra-yummy this week, I've been experimenting with Mrs. Stein's recipe. Meat, potatoes, barley. Onion powder, garlic powder, salt, pepper, and some Israeli barbecue spice. Not too much water. Delicious. I was talking to some non-Lubavitch ladies about pesach. Lubavs have a lot of pesach chumrahs (as do most chassidim). Things like only eating fruits and vegetables that can be peeled, not getting our matzo wet (except on the 8th day), no pre-packaged foods, etc. I minimized them by referring to them as "Chabad pesach kookiness," which afterwards I regretted. I should have stood tall and proud over my beautiful, strict pesach. Today Yaakov is going to clean my car. It will undoubtedly take him hours. It's a total mess. I wish he would do it closer to pesach. That would give me more time to relax in the car, and not worry about chomeitz getting in it. I still have a couple of weeks of running around with kids, a couple of weeks of trips to the park with pita sandwiches. But what can I do? It's his deal. He's doing the job so I have to let him do it on his terms. f) Physician's Formula cream concealer: It's green. It neutralizes redness. g) Maybelline "fair ivory" concealer. To cover the green. h) Cover Girl professional loose powder, "translucent fair." To calm the shine. I ask you, who do I think I'm fooling? The handyman came 2 hours late. Then, after being here about an hour and a half, he said he had to go. "I'll be back in five minutes." He came back in an hour. With his 6 year old son. I didn't mind at first, but as the day wore on the kid got unruly. The task to minding all the children fell to me. Plus, I had to feed the kid. I mean, the guy brings his kid with no food, no snack, nothing! I was sweet and polite, but I started feeling very resentful. Oh, and the kid was wearing a shirt with Jesus on it. That was just splendid. I wish I was brave enough to say, "I appreciate you coming to work here, but I can't watch your kid." I know several of my friends who would have said just that. But I let myself be a door mat sometimes. I don't know why I couldn't say - nicely but firmly - that this was beyond my limitations. I find being assertive very difficult. The day schlepped on and on, he was working so hard stripping the wall. All I could think was, "there's no way we can give this guy 20 bucks for all this work." The way it originally sounded was like it would be an hour or two, but he was here for probably six. Yaakov and I went back and forth on how much we should pay him. "He should pay ME for babysitting!" In the end, we gave him 60. Yaakov told him, "you have kids to feed, you can't work for peanuts." He was surprised to get that much. Yaakov told me later, "It's a kiddush Hashem. I hope he thinks that Jews are nice." He'd just better! I fed his Jesus t-shirt kid the last of my bishul yisroel tuna! We're renters. When we moved into this house, we did a lot to make it "live-able." Some things we figured we would leave "as is", considering the expense. We are having other problems, due to the fact that there are openings in the screen ventilation at the bottom of the house. This is an issue that my landlady is willing to take care of, and a handyman came over the other day. When he was here, I asked how much it would cost to strip the wall and repaint it. "That's not a big job," he said. "Twenty bucks." I am SO EXCITED. Twenty bucks! All we had to pay for was a gallon of paint. The handyman is due here any minute, and I can't wait. If I had known it was gonna be this cheap, I would have done it 2 years ago. And while he's doing his thing, I'm going to pesach-clean the pantry (conveniently located right next to the yucky wall). I'll be able to do this, because Srulik and Rivky will be watching the handyman in complete wonderment. They'll be watching, and I'll be cleaning. I know all you balabustes out there are thrilled for me. I went to the girl's high school production tonight. It was based on a true story of six Lubavitcher boys, learning in an underground yeshiva in Berditchev, Russia. Perhaps I should say the Soviet Union, as it was during Stalin's time. Anyway, their yeshiva got busted by the secret police, and the boys - all around 14 years old - got put into a communist orphanage. They were to be "reformed" of their religious heresy. They secretly made contact with chassidim on the outside, who managed to get them train tickets to Kiev. They were instructed how and when to escape. Five boys got on the train. The 6th one - Folleh - ran back to get his tefillin and missed it. The five who got on the train eventually made their way to America and Israel. Folleh escaped to a local city, Sartov, and continued his learning. He eventually became the Rav and lived out his life there. The other five stayed in touch through the years, but no one knew what happened to Folleh. They only knew he missed the train, and feared the worst. One day, 50 years after the escape, the old Sartov Rav went to the local sofer to have his tefillin checked. In the sofer's office he met a young man, and they started talking. It turned out this man was one of the sons of the other five! He was so excited to find out Folleh's fate, and a reunion was arranged for the 6 "escapees." Alas, Folleh passed away before the reunion took place. But man, what a story, right? The most poignant part of the production was a video clip of the Rebbe at a farbrengen. I think it was during the 70's. He was crying. There were Jews behind the "iron curtain" who couldn't practice Judaism, through no fault of their own. Seeing the Rebbe cry like that made me start to cry. I'm glad I didn't wear mascara. Bedroom closet, to be exact. Yaakov and I cleaned it for pesach this evening. I got rid of so many clothes, va voy! The thift store will be so happy to see my donation box. I got rid of tons of wire hangers, too. I am also going to be brave and part with my bas-mitzvah dress (see picture at right). It still has its dry cleaning tag in it. It's been hanging in my closet forever. Goodbye, chintzy dress. I loved you once, 17 years ago. 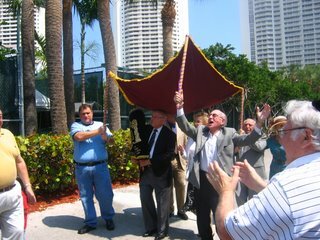 Remember you and me on the bima at Temple Beth El? What a team! We shelved tons of books, some of which migrated from the pesach-cleaned front closet. High school yearbooks, comics, and Yaakov's sci-fi collection (bonus nerd points for the "Star Fleet Manual"). Not to mention the stunning National Geographic "Titanic" collectors' edition. Yaakov organized his music gear. We found space for his bass and my beat-up acoustic. I put some old wigs safely in a bag. I got rid of lots of his old, stained shirts, but was denied the pleasure of discarding another ripped-up shabbos kapoteh (he wants to wear that one out to dinner, too, I guess). We cracked Beavis and Butthead jokes and Yaakov warned me several times to back off with my pesach O.C.D. I believe that phrase is popular with the Narcotics Anonymous crowd. Damn if it 'aint true. I know I've probably written about this a zillion times: money. My issues with it, fears over it, elation from it, yada yada. I've blogged about needing to have a little more faith/trust in Hashem that he'll take care of me (us). There's a purim mitzvah called matanos levyonim, basically giving charity to at least 2 people. On purim, some yeshiva boys knocked on our door. They got the first mitzvah. Purim came and went, and I realized we never gave to a second party. I also realized that I never took 10% out of the money I received at the jewelery exchange. That is the halachic requirement for tzedoka - at least 10% of one's earnings. I got 350.00 total, so I took out 40 bucks and left it anonymously in an envelope on someone's door. I asked G-d to please consider this our second mitzvah of matanos levyonim. That was my intention, even though purim had passed. The money was coming out of our weekly budget, and I knew we'd be tight. But I also know that G-d gives to us when we give to others. Tzedoka is the portal for heavenly assistance. So I let go and let G-d. I trusted that I was doing the right thing. 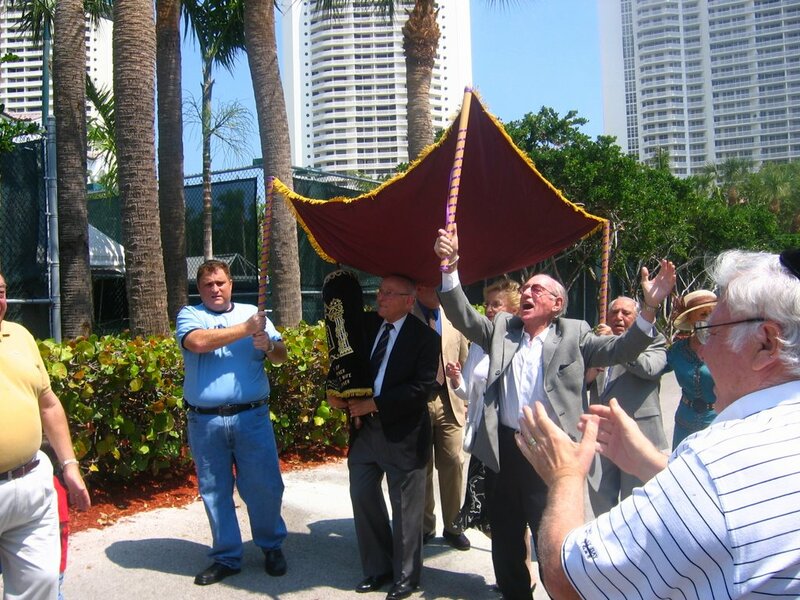 This morning, Yaakov got a phone call - would he play bass drum at a Hachnossas Sefer Torah? My favorite event! Of course he would! And he got 50 bucks for it, too, something he would have gladly done for free. I can't help but think that it's quid pro quo. Thank you, Hashem - we needed the extra grocery money. And thanks for giving us such a good time earning it! Yesterday, all my kids were off from school so I took them to the local playground. It so happened that I saw my husband's boss and his family there, too. My kids were playing as I sat on the bench saying Chitas, getting up every few lines to peek at my kids. Occasionally I swapped words with Boss-Man and Boss-Wife, but they were doing their thing and I was doing mine. They left, and we stayed another 20 minutes or so. I rounded up my kids to get in the car, no easy feat. Srulik did his whole car seat routine, fighting me tooth and nail to get strapped in. Chaya - right in the middle of the wrestling match - asked if she could have her toys. I told her I would take them out of my bag as soon as she was strapped in. She didn't listen. She went into my bag and got her toys, and then strapped herself in. I went ballistic. I started yelling that I was going to take her toys away for a whole week, and WHY CAN'T YOU JUST LISTEN TO ME!! and blah blah, basically just losing control over something really, really stupid. I'd like to blame it on the Srulik car-seat stress, but there's no excuse. And then I realized that Boss Family was 2 cars away from me. They hadn't left the park yet, and were just getting in the car right then. I can't help but think that they heard me coming unglued. I mean, how could you NOT hear me? I. AM. SO. EMBARRASSED. I felt bad enough that I lost control like that, but to lose it in front of my husband's boss? On the way home I apologized to Chaya. I told her that I was unhappy she didn't listen to me, but it didn't warrant me yelling like I did. I wish Boss-Man coulda heard that. Monday night I hustled the kids to be on time for the megilla reading. I gave Srulik to Yaakov and kept the girls with me. The megilla reading was fun, made more so by Rivky's startled reaction to the first "Haman." Oh, I laughed SO hard. After each Haman, there were pranksters in the men's section who just had to get in the last noise. One guy had a whoopee cushion. Tuesday morning we all put on costumes. I wore an old Dead t-shirt (c'mon, when else do I get to bust that out?). Yaakov went to the first megilla reading and I went to the second, and then we got in the car to distribute shaloch manos (purim goody bags). We drove to my mom's office and gave a lot there (tons of Jews at the gastroenterologist). We drove to the nice man at the jewelery exchange and gave lots away there, too. We surprised my grandparents. We even met a Jewish toll booth attendant on the turnpike, and gave one to her. Then we came home and delivered around the neighborhood. I was gratified to see that our front door had lots of shaloch manos waiting for us. We went to a block party and spent a couple of hours there. The kids got their faces painted and jumped around in the bounce houses. Srulik kept losing his pants and showing his little tush to the world. Then we went to a communal purim meal and I ate waaay too much. Honestly, who can turn down handmade mashed potatoes and gravy?. It was a lovely purim. It's Adar. Tonight is Purim. I should be thrilled, excited, hooray hooray. I'm not. I don't feel so good. I found out late last night that my dorm mother from yeshiva lost her husband. They'd been married forever, and were under the chuppah with Yaakov and I. The funeral was this morning. I feel weary and sick and throw-uppy. Then I read a headline on CNN involving a 7 month old baby. I'm glad I had a napkin with me - I literally spat out what I was eating, I felt so gross. I dunno. It's just a yucky day. When my mother-in-law was here she gave me some jewelery. Pieces that my husband's father had given her, when they were married. They were diamonds, but the setting was old and I personally didn't care for them. I decided I was going to sell them - with Yaakov's permission - and use the money to help make Pesach. I went to the jewelery exchange today with my kids and wandered around, trying to figure out the best place to try and sell them. Finally, a man called to me from his counter and asked if he could help. "Maybe," I said. "I'm trying to sell some jewelery, do you buy?" He said he did, and he looked at the pieces. "I can't use these personally, but I'll clean them for you." He cleaned them while he and his wife and I started talking. It turns out they were Jewish too - shomer shabbos, in fact - but the husband did not wear a beard, nor a yarmulke to work. The wife wore pants and her hair was uncovered. "We're modern," she said. I would have never known they were Yidden. Usually my Jew-antennae are pretty sharp, but this couple eluded me entirely. He said, "You'll never get what these pieces are worth, you're better off keeping them." I told him I had no use for the jewelery, and I wanted to use the money towards Pesach. He told me how much I should ask for, and wished me luck. I walked away, but a moment later he called me back. "I don't mean to offend you, but I'd like to give you a little something to help with Pesach." I told him I thought we would be fine. The extra money I made from the jewelery would be helpful, but even so, I thought we'd manage. "Please," he said, "I want to. You could use it for Purim if you wanted, buy some costumes for the kids." His wife piped in, "Today is his father's yahrzeit, he would be so happy to give it to you." What could I say? He handed me an envelope. I thanked him and told him that I wished we could make a l'chaim for his father. "You want to make a l'chaim? No problem!" Out came the vodka, a Russian brand (with only Cyrillic on the label). He asked me if I was driving. I assured him I was only having a teensy sip. "Besides," I grinned, "I'm a Lubavitcher. We know how to hold our liquor." They laughed and grabbed some cups. We made a toast to his father, Reb Yaakov Yehuda, and blessed each other. I ended up selling the jewelery to someone else, and made a decent amount. Not as much as the pieces were worth, but something. And when I opened the envelope I was given? A hundred and fifty bucks. In the NY Times online I read a fascinating article about an imam in Brooklyn. His name is Sheik Reda Shata and he is the spiritual leader of the Islamic Society of Bay Ridge. He originally hails from Egypt. He still speaks no English. I found his life and his story compelling. I found myself really liking him quite a lot, actually. Last night I spoke with a frum friend, she read the article too. She also found him special. What is interesting are the parallels I found between Muslims and frum Jews. We both have a body of religious law that we live by. We both tend towards modesty, large families, and G-d centered lives. The rabbi/imam carries more weight with us than American law-makers. The imam has tried to find answers to help his American followers. He strives to be flexible in his interpretation of Islamic law, to meet their needs. He said something about how he considers himself to be like a doctor, not a judge. "Because a judge sentences - a doctor tries to remedy." He said, "Islam is here to make people's lives easier, not harder." How many times have I heard that same line regarding Torah (l'havdil)? He seems to be warm and open minded. He is trying to introduce new concepts to the Muslim mind, like psychiatric care and domestic violence intervention. He is crossing boundaries that are unheard of in Muslim-dominated lands. He works hard to protect his women congregants, in a manner of modesty and practicality. Some women complained they felt nervous on the subway wearing their head-coverings. He told them they could take them off, if they felt threatened. But what really touches me is that he has a severely epileptic daughter, a 7 year old named Rawda. I feel so much sadness for this family. His wife can hardly go out of her home, as Rawda seizures so much. No one should suffer like that, especially an innocent child. He holds her in his arms and gives her medicine, saying "Inshallah," - "With G-d's Help." I want to write him a letter, but it's probably not appropriate. If I could, this is what I would say. I read the article about you in the NYT and I really enjoyed it. I liked your love and compassion towards your congregants. I like how you strive to be open to their needs as American Muslims. I am sad for your daughter, Rawda. I am touched how you and your wife work so hard to care for her. I give you a blessing to find the right medicines to help her. May we merit to greet Moshiach immediately, so she may have a complete recovery. I don't know about the Moshiach part though - that might be too weird to send to an imam. But maybe they believe in that, too. What Have You Cleaned for Pesach Today? That's the sign I want to put up on my front door. That's the thought that flashes - in neon red - through my brain. Today Mrs. Stein had my kids, so I cleaned the front closet. I figured it would take me about an hour, but that sucker took three (minus a 15 minute lunch break and 2 trips to the bathroom). I got rid of tons of old clothes and a huge wicker trunk. I vacuumed out jacket pockets and wiped down lots of spare computer parts (Why Yaakov insists on hanging on to 3 old lap-tops is beyond me). I found Chaya's pink sweater. I made room for the high chair Srulik is no longer using. I followed the organizer's rule: If it's not used in a year's time, get rid of it. I tried to get rid of an old (ripped) shabbos coat of Yaakov's, but he wouldn't let me. He probably wants to wear it when he takes his lap-tops out to dinner. I'm thinking about it. It's less than 6 weeks away. I was in the grocery store buying peanut butter, and I realized I should go for the smaller jar - less to throw away when I clean the refrigerator. Actually, Yaakov generally cleans it. G-d bless him, he helps so much for the holiday. Tonight, while Srulik played in the tub, I cleaned underneath the bathroom cabinet. I threw away a whole box of old medicines, creams, yada yada. Now all I have to do is scrub it out and wipe down the items I'm keeping. There is the concept of "selling your chomeitz" on Pesach. All the leavened items and other supplies (cosmetics, etc.) that might contain chomeitz need to be sold to a non-Jew during the 8-day festival. Many weary balabustes close up closets, rooms, or their entire houses, and "sell" them for Pesach. I learned how to make Pesach from a very strict woman, and she had a different view. "Even items that a person sells have to be clean. Nobody wants to buy something that isn't clean and nice." Consequently, practically every surface of my house gets cleaned. I clean my kids' toys, then lock them away. I'll wipe down the medicines and cosmetics I can't use on Pesach, and tape the cabinet shut. Last year when I was cleaning the top of my kids' closet, I found a dry, old noodle. You can just imagine my triumph. Because I make Pesach in a strict manner, I really need to get moving. Anyone will tell you that the kitchen is the most important place to be clean. So if I want to indulge in my stringencies, I need to tackle them little by little. That way when it's REALLY crunch time, I can clean my kitchen, scrub the chairs, etc. And I still have to get through Purim! 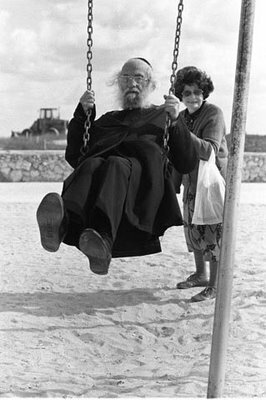 On shabbos afternoon, I headed toward the playground with my uber-hyper kids. After walking awhile, I looked down and saw my finger was bleeding. I stopped at a friend's home, but she wasn't there. So I saw these frum ladies, and I asked if either of them lived close by and if I could get a band-aid. One lady did, and kindly invited me in. So she gave me the band-aid, while my kids got sucked in by her many birds. She also had - are you ready for this? - chinchillas. She went to take one out of the cage, so my kids could pet it. I didn't know what to say. I learned that one should not pet an animal on shabbos, unless the animal is yours (and comes up to you needing affection). And then there was the issue of putting the animal back in the cage, which I believe falls under the category of entrapment (also a shabbos no-no). I didn't want to be rude and tell my kids not to pet her fur-ball. There was also the fact that chinchillas are not kosher. My kids DO encounter non-kosher animals, and we usually talk about how they are G-d's creations. Sometimes I'll launch into my "Noach and the teva" shpiel. They are so used to my routine, they'll tell me the animal isn't kosher before I even start. Our policy is; no non-kosher animals in the home, relaxed attitude about them outside. I decided long ago that if I got uptight, it would become an issue. Besides, my step-shvigger has dogs. And then there was the warming tray she had. I take a class on the laws of shabbos with my Rav, and we just finished learning how electric warming trays are a problem. They get so hot, that using them could fall into the category of cooking - another forbidden thing on shabbos. Again, I didn't know what to say. Maybe her Rav had a different opinion on such a tray? And who am I to tell a complete stranger how to observe shabbos? I'm not a Rav - I'm just a Jewish woman striving to keep shabbos myself. But there were little things that were just different. She had lots of stuffed animals all over the place - even pigs. And she had a TV, and lots of cartoons and videos. She had only two sons, aged 11 and 12. She said she had a third pregnancy, but when it ended in miscarriage she decided (!!!) not to have any more. Definitely a novelty. Despite our differences in hashkafa, she was a wonderfully warm and friendly lady. We spent the rest of shabbos schmoozing, and we never did get to the playground. After all, who needs a playground when you have a zoo? When her husband came home, she said to him, "Look, we have chassidic guests." I was embarrassed. She asked me if we were chassidim, so I told her we tried to be. But to be introduced like that, I don't know - I felt weird. Yaakov is having a tough time at his jobby-job right now. He's a programmer. His boss is asking him to do things which he feels he wasn't hired for, things that are outside of his skill-set. He's asking him to do system administration stuff. Yaakov has been pulling a lot of late-nighters working from home. He's tired. He's cranky. He's stressed. His boss is being very criticial. I'm trying to be the nice, supportive wife. I'm trying not to worry that maybe Yaakov will lose his job. There's a story I read once about a frum Yid in NYC, who was having a hard time getting a job. He was thinking, "Maybe I should trim my beard, or not wear a yarmulke to interviews." He spoke to his rabbi. The rabbi said, "Who signs the paycheck - the boss, or G-d?" I'm trying to remember that. Whatever Hashem wants is what's going to be. All I can do is make a keili - a vessel - for G-d's blessings. 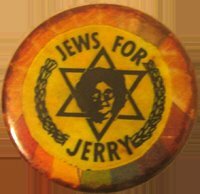 All I can do is be a loving wife, and keep on doing mitzvos.